If your gardening habits extend beyond the miniature and the glass-enclosed you may be thinking about starting spring seedlings for your garden. 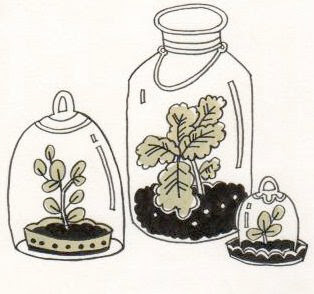 Maria at CityDirt.net would like to remind you that terrariums and bell-jar arrangements are a great way to start seeds! If you live in a small space and the seedlings are visible, grow them in something that looks nice. When cultivating small amounts of salad greens indoors use Edwardian terrariums made of glass and metal or a large cloche with saucer. They have the same greenhouse effect as the plastic kits, yet look nice in your living space. Salad greens grow quickly from seeds and starts work even for the impatient gardener. Herbs, especially the woodier ones like rosemary, are much more slow growing and so it's worth it to just buy them as starts. For smaller starts, get very small, clean terra cotta planters with drainage holes in the bottom. Fill them with good potting soil and plant a few seeds in each one. To intensify the heat and light, put them under a cloche, or a bell shaped glass, or inside a glass terrarium. This will also look very nice and could go in the center of a table if it's in a sunny spot. Keep the seedlings moist. When they start to sprout, remove the glass cover. If there are too many plants growing up against each other, cull out the spindlier ones. After each plant has a few leaves, fertilize them with worm castings. If they are going to be outdoor plants, they will need to be hardened off, so put them outside on mild days, and bring them back in at night. Do this for a few weeks, and then transplant them into your window box. Save your cloche, terrarium and small terra cotta containers for the next round of seeds or plant small, tropical houseplants in the pots and keep them under the glass as a centerpiece. This is excerpted from A Little Piece of Earth, How To Grow Your Own Food in Small Spaces published by Rizzoli Books, Feb. 16th, 2010.